ROSEAU, Dominica, Sep 6 2017 (IPS) – The tiny Caribbean island of Dominica has moved one step closer to its dream of constructing a geothermal plant, a project that is expected to reduce the country’s dependence on fossil fuels. The Dominica government is contributing 40.5 million dollars towards the project and has been seeking to raise the additional funds from various sources. The road towards geothermal has been a long and arduous, not only for Dominica but also its Caribbean neighbours. “In addition to government’s contribution we have secured all the funds required to construct the plant from our development partners,” Prime Minister Roosevelt Skerrit said, noting that the funding will include EC$30 million from Britain, EC$5.4 million from New Zealand and also EC$5.4 million from SIDS DOCK. SIDS DOCK is an initiative among member countries of the Alliance of Small Island States (AOSIS) to provide the Small Island Developing States with a collective institutional mechanism to assist them transform their national energy sectors into a catalyst for sustainable economic development and help generate financial resources to address adaptation to climate change. It is called SIDS DOCK because it is designed as a “DOCKing station,” to connect the energy sector in SIDS with the global market for finance, sustainable energy technologies and with the European Union (EU) and the United States (US) carbon markets, and able to trade the avoided carbon emissions in those markets. Estimates place the potential value of the US and EU markets between 100 to 400 billion dollars annually. Skerrit noted that the environmental and social impact assessment for the geothermal project is ongoing in the Roseau valley. “Every effort will be made to ensure that adverse impacts on the communities and the environment will be mitigated,” he said, adding that land owners in the area can also expect to be compensated for use of their property and support will be provided to residents who occupy lands to ensure that they are not left worst off. The designs for the plant are progressing and should be completed by the third quarter of 2017. “Once the plant has been commissioned, the DGDC will sell power to DOMLEC (Dominica Electricity Company) to be distributed throughout the country. “So far, I have been advised, that based on the regulations of the Independent Regulatory Commission (IRC) DOMLEC must pass on the lower tariff to the consumer. That is to say DOMLEC is not allowed to add to the cost at which the power will be sold. This will ensure that the lower cost of electricity from geothermal will pass through to the consumers of our country,” Skerrit said, adding that negotiations are ongoing with DOMLEC to finalize the terms of the power purchase agreement. Dominica has also applied for grant funding from the United Arab Emirates Caribbean Renewable Energy Fund and is expecting between EC$8.1 million and EC$13.5 million to fund a battery storage system to be used on the national electricity grid. Skerrit said funding for this project will also be obtained from the World Bank in the form of a loan of EC$16.2 million at a highly concessionary rate of 0.75 per cent with a 10-year grace period and 44-year repayment plan. “We have invested millions thus far,” Skerrit said, adding he is confident citizens “all look forward to the significant reduction in the cost of energy that will follow”. He said the development of the plant “will be a positive impact on businesses and this should also stimulate investments by others establishing new businesses”. The road towards geothermal has been a long and arduous, not only for Dominica but also Caribbean neighbours St. Kitts and Nevis and St. Vincent and the Grenadines. Last December, Energy Minister Ian Douglas said Dominica was moving closer to harnessing geothermal energy. He said the Dominica Geothermal Company had been registered, and planning of the power plant is progressing. “We are moving ever closer to the vision of realizing power from our geothermal resources. 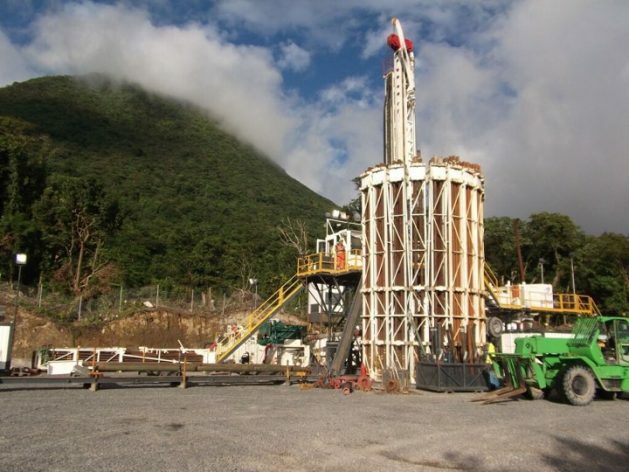 The Dominica Geothermal Company has been duly registered, and plans for the construction of the power plant are progressing satisfactorily,” he stated. This follows a decision made by the government to run the geothermal project as a company solely owned by the government and people of Dominica. Earlier this year, the St. Lucia-based Organisation of Eastern Caribbean States (OECS) Commission said financing and government policy had been identified as the major challenges to the development of geothermal energy in the Eastern Caribbean. A survey, conducted by the Energy Unit of the OECS Commission, gathered the views of 86 people involved in geothermal energy, half of whom were based in the OECS region. The respondents of the survey were geothermal stakeholders working with or with an interest in geothermal energy in the nine-member sub-region. According to the OECS Commission, most of the respondents (82 percent) were employees of government or utility companies pursuing geothermal energy initiatives. With respect to non-OECS respondents, almost 50 percent were private sector geothermal experts with past experience working on geothermal projects. “There was clear consensus amongst all survey participants that finance and government policy are the main challenges to geothermal energy development in the region. These were followed closely by competition from other energy sources, and technological issues,’ the Commission said. It said the majority of survey participants would like to see the establishment of a regional mechanism to support geothermal development in the region. The Commission noted that all countries of the Eastern Caribbean are almost totally dependent on imported fossil fuels, despite their significant potential for renewable energy such as solar, hydro, wind, and geothermal. In recent years geothermal energy has emerged as a priority for the OECS region. Currently, seven of the ten OECS member states are working towards the development of their geothermal resources. The scientific evidence shows a strong potential for development as countries continue to assess and quantify their geothermal potential. The Bouillante geothermal plant on the French island of Guadeloupe is the only geothermal power plant currently operating in the Caribbean. It’s been operating since 1986 and currently provides about six percent of the electricity in Guadeloupe. Category/ies:Dominica Articles, Dominica News, Dominica Projects, Energy for Young Minds, Geothermal Energy, News, Regional Article, St Kitts and Nevis News, St Lucia Articles, St Lucia News, St Vincent and the Grenadines Articles, St Vincent and the Grenadines News.